Mike Dunn and Frank Rolla interviewed November 2009. A few years ago, while Mike Dunn was working at the Colorado College-based radio station KRCC, a co-worker, holding an album of folk songs from the mid 1960s, approached him. He showed him the cover. “I heard him doing this song that really stuck with me. It was about a guy who murdered his girlfriend, and the mother wanted to know why he was so bloody, and he said he had a bloody nose,” Mike Dunn said. Saying "Dear son, what have you done to bloody your clothes so? I told my anxious Mother, I was bleeding at my nose. It would take him four years to find out the name of the song. “Then one day I’m at Southern Colorado State College, in Pueblo, and I see the guy who played it at the dance - Frank Rolla." Rolla solved mystery, admitting that the song he sang that night was "Knoxville Girl." With a common interest in folk music, the two became friends. While Dunn was going to school at SCSC, he became part of a group, the New Mobile Strugglers. 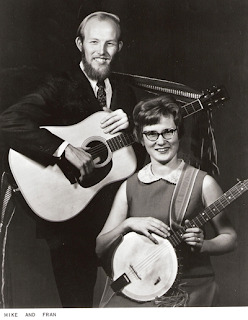 “This was 1966, and I was one of three banjo players in Pueblo – one being Frank Rolla and the other Frances Love.” Love, who was married to SCSC professor, Dr. Alan Love, was one of the few women folk singers in Pueblo. “Frances played ethnic folk, and knew lots of people in the music business,” Dunn said. Mike and Fran took their act on the road, playing the Winfield Folk Festival, on the same bill with Doc and Merle Watson. When they returned, Fran proposed that they make an album. Feeling that their sound needed a second banjo player, Mike looked up his friend, Frank Rolla. 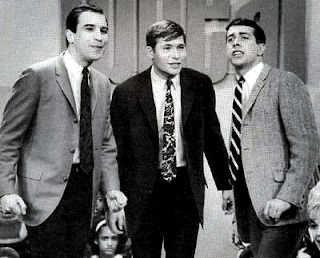 The trio recorded the LP in the summer of 1967, with the help of producer Bill Cook, a Los Angeles based engineer, who had worked with Benny Goodman, and Bing Crosby. Cook had recently relocated to Colorado Springs, where he had just purchased KRYT and later KKCS. “The record took three days to make,” said Dunn. “Fran financed it, and we did it at Cook Recording in The Springs. They put two mics in the room and everyone sang and played at once.” The album features a variety of public domain folk songs, with the exception of “Summer Love,” written by Frances Love. 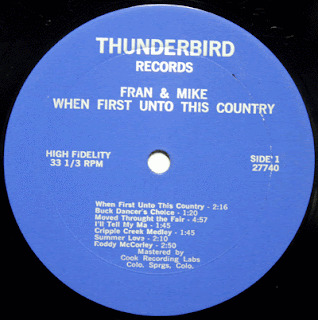 The album was entitled When First Unto This Country. The title song was originally discovered by John and Alan Lomax some 30 years earlier, when the audio archivists taped another duo, Foy and Maggie Gant, singing it in their Austin, Texas home. The front cover of the LP was shot in Pueblo City Park, off of Goodnight Avenue. An estimated 500 copies were pressed. 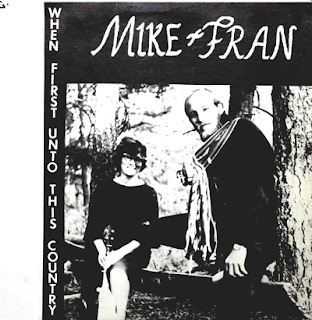 Listen to "When First Unto This Country"
While jamming with several fellow musicians on a concert tour stop, the duo met up with the singer, who was known professionally as John Denver, and who had just replaced Chad Mitchell in the Chad Mitchell Trio. Mike and Fran traveled until 1971, when Fran, who had since divorced, met a sailor at a stop in Kodiak, Alaska, fell in love, and decided to stay. “And that was that,” Dunn said. Dunn stayed on the road for about ten years. He went on to host a Sunday morning radio program on KRCC, and then hooked up with a number of Colorado Springs bands, including New Dimension, Boogie, and the Colorado Swings Band. He worked for Colorado College as a gardener, a position that he held for 13 years. Most recently he plays with Tube Radio Orchestra and the Jazz Beau’s Rent Party. He plans to release a CD of jazz and swing compositions, with the help of local Springs musicians, entitled Lowering Standards. He has lost touch with Fran. "This was the first record I ever appeared on," said Dunn. "When Fran asked me to be her guitar player back then she literally opened up the world to me. 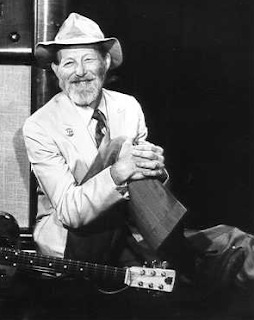 Meeting people like Doc and Merle and many other great folk musicians - it was a valuable experience." Most recently he performs in The Transducers - a group of five composers who utilize a variety of laptops, custom software, sound sculptures, circuit bending and custom electronics, to produce music.